To be honest I was sad by the thought of not getting an invite to Tibi's Spring show but to my surprise I got an invite in my inbox asking to RSVP. YES YES and YES. When walking into the Stage and seeing the unique runway set up (they had a row of seats right down the middle of the runway creating two walk ways) I knew I was in for a thrill. Tibi's collection did not disappoint. Girly frocks, wide leg pants, clean and sleek lines ruled this runway. 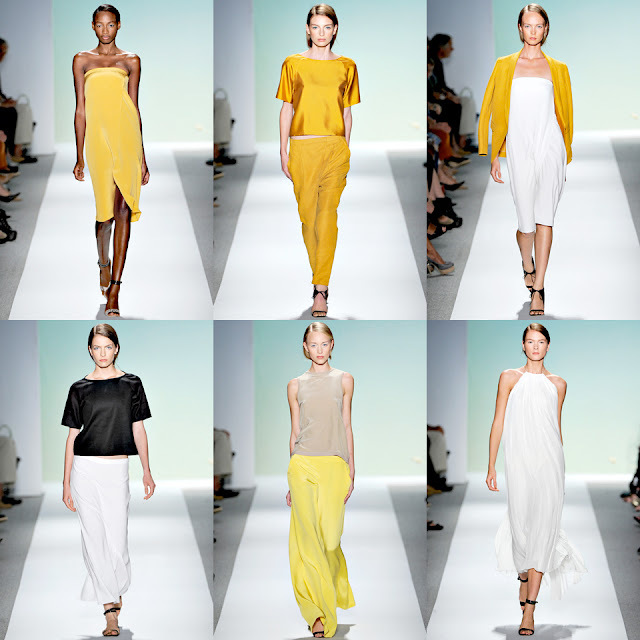 I'm a huge fan of clean lines (reasons why I love lines like Celine and Chloe)....and neutrals...and pastels....sooo Tibi's spring line was a grand slam for me. I was also please to see that mint green isn't going anywhere either since my closet slowly became full of mint green clothing this past summer. I think elin kling did an amazing job!